Hello my name is Segun and I am a recovering Perfectionist. There I said it; I let the dirty little secret out of the bag! So let me ask you a question…Are you someone who sits and waits for things to be perfect before you do anything? Do you struggle to move forward until things are just right? And do you feel that everyone is running right past you to the finish line and you are at a bit of a stand still? Well you might be a perfectionist too and I welcome you to the party. Want to know more? Ok I’m going to stop sounding like an infomercial now. Here’s my story…. One of my biggest strengths is my attention to detail and I strive to do things perfectly. Unfortunately on recent reflections, I realised it was also a flaw as I found that I would struggle to move forward on things if I hadn’t dotted the I’s and crossed the T’s then gone back to do it all over again and finalised it with a huge red bow! I finally had an aha moment not too long ago when I realised that I had lost out on an opportunity. The reason being that because I was trying so hard to perfect my entry I essentially couldn’t finish it on time and missed the deadline. When I saw the winning entry and saw how simple and uncomplicated it was, I had my light bulb moment! I then sat down and reflected on what had happened and realised that my drive for perfection was actually holding me back. I have so many things that I want to do with life and with this blog but I keep holding back. I thought I was planning but I was really procrastinating, and looking into it a bit more I realised that the real issue behind the need for perfection was fear. A fear of failing, judgment, and not putting forward something that is good enough, but I have come to learn that this becomes a prison of your own making. It not only stops you from living your life in the moment or from experiencing and learning but it also stops you from truly being seen. I kept waiting for things to be perfect, to have things be just right before I did something or moved forward on something. Its amazing what a little retrospection can do, as I came to realise that I was waiting for things and life to be perfect whilst life for waiting for me. I finally understood that I needed to take a step of faith, start walking towards whatever it was that I wanted to do. It didn’t need to be perfect or planned out in complete detail, it just needed the first step and that not only is it just fine/good enough the way it is, but I can always work out the details as I go along. You see perfection is unattainable, it doesn’t exist and by trying to achieve perfection we are simply setting up ourselves to fail or when we fulfill whatever condition of perfection we have set for ourselves, we find another condition to replace it. For example when I’m slim enough, have had some lessons, have a new haircut, have overperfected my CV and the list could go on. What does exist is life and it’s meant to be lived wholeheartedly and completely. This doesn’t mean that we shouldn’t plan or strive to do things well, but I believe it means that we shouldn’t let fear hold us back. In fact one of the beautiful things about being human is that we are imperfect and if we do fail we can always try again. So if this post seems a little different or a bit rough and ready, well it is. I have been wanting to start a motivation series for a while on my blog but as mentioned was a little nervous about going for it. 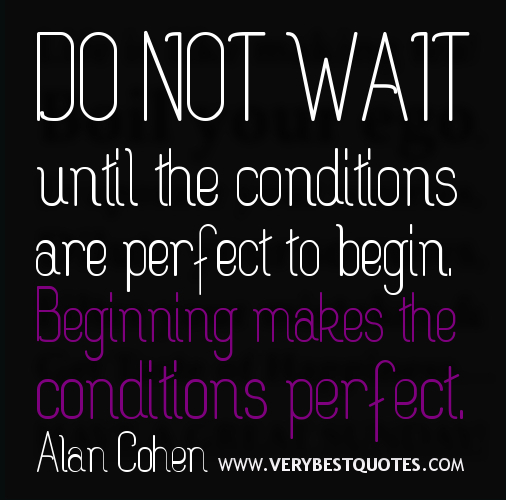 But I decided that one of my recovery steps to reducing my need for perfection is to simply start going for it. So this is my first proper step forward where I am sharing it with you, there was no over analysing, discussing or perfecting. It’s just my leap of faith. So here is my encouragement for you today. If any of this rang true for you and you feel like you are waiting for things to be perfect before you act or move forward. Start by taking a step forward with immediate actions. If there is something you want to do don’t wait for it to be perfect, just go for it and know that firstly you and what you are doing is good enough and secondly start living in the moment and know that you can always improve as you go along. The challenge is, are you willing to take a step or a leap of faith forward? If so please do leave a comment below letting me know what you are moving forward with and know this, I will happily join you at the Perfectionist Anonymous Meeting! If you liked this post or have any thoughts please do let me know in the comments section below. P.s Still deciding on a name for this series. I’m currently using Motivation Mondays. Let me know what you think about the name.